NanoEye (Fig. 1) demonstrates that it is possible to dramatically reduce the cost and time required for the development of space-based observation systems capable of incorporating a range of payloads. The short time (< two years for the first article, then several months each) and low cost (< $2M recurring Electro-optical, < $2.5M recurring Electro-optical/Infrared) of fielding these systems also allows the introduction of new technologies much faster and at less cost and risk than would otherwise be possible. Microcosm has developed a small, low cost, very high agility, responsive (launch in < 8 hours from the time the launch vehicle and satellite arrive at the launch site), multi-mission satellite. It incorporates Microcosm’s all-composite unibody structure with mostly space-qualified CubeSat bus components and a small diffraction-limited telescope that provides up to sub-half-meter resolution at nadir at perigee. Because the NanoEye spacecraft provides significant margins in terms of power, mass, delta V, and control authority, it can be used for a range of missions with minimal variations in hardware and software. NanoEye’s dry mass is 25 kg. With a full load of 55 kg of hydrazine propellant, the spacecraft wet mass is 80 kg. The baseline telescope has a sub-0.3 m aperture. The spacecraft bus components are comprised of CubeSat components available from multiple providers. The advanced all carbon composite unibody bus construction is provided by Scorpius Space Launch Company, a sister corporation to Microcosm and a world leader in advanced carbon composites systems for launch system and space applications. This team has both the experience and expertise to develop spacecraft that meet the needs of multiple end users at dramatically reduced cost. An independent classified Mission Utility Analysis was conducted by The Aerospace Corporation and demonstrated that a NanoEye multi-satellite constellation compared very favorably against alternate capabilities. The results can be provided upon request to those with the appropriate security accesses. An independent cost analysis by the Air Force Space and Missile Systems Center (SMC/XR, now SMD/AD) agreed overall with the non-recurring engineering (NRE) costs and recurring costs for NanoEye. The key characteristics of the NanoEye spacecraft are as follows: very high resolution due to its ability to orbit at very low altitudes; very large available delta-V of several km/sec that provides exceptional orbit agility, along with exceptional field-of-view agility and large field of regard (Fig. 2) due to its high speed scanning capability; utilization of Microcosm’s autonomous orbit control validated on two space missions; high speed downlink capability to portable and fixed ground stations (Fig. 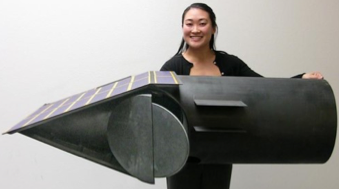 3); and sufficient power to support a wide range of payloads. The NanoEye system concept is shown in Fig. 3, which includes another Microcosm technology, the paradigm-changing Demi-Sprite launch vehicle shown as a full scale mockup that is capable of launching a single NanoEye into LEO for < $4M recurring, not including range costs. 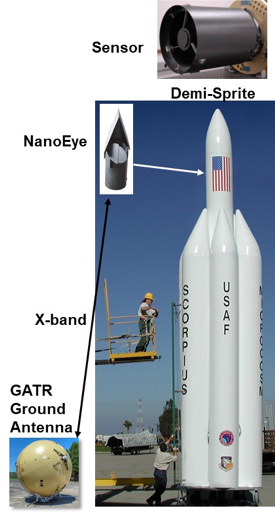 Shown in the figure are the NanoEye spacecraft, the Mini-Sprite launch vehicle, the telescope currently baselined, and the transportable GATR ground tracking antenna.